I think today might actually end up being one of those short snippet posts I keep saying I'm going to start writing. I feel a bit obligated to post because I haven't done as much lately, which I know is a silly reason to post, but there it is. We take our motivation where we can get it. Have you ever heard God speaking to you? I mean, more than just a sense of His presence or a general leading in a certain direction? Last night on my way to work, I was coming around the curve at the top of the Red Hill Parkway, and I don't know if it was the music I was listening to or the way the sun angled through my windshield, but I suddenly and very clearly heard Him say to me, "I love you. You are mine." It wasn't audible, but it sure was clear. It was one of those goose-pimply moments where I felt so close to Him, a closeness I haven't felt in some time because sometimes you're just in one of those seasons where you're walking more by faith than by sight. It's in those seasons when the brief moments where you walk by sight are that much sweeter and more precious. So today, facing another day of caring for the kids by myself after Nathan got me up for the day at 4:30, I'm remembering His words, that moment from last night. He loves me. I am His. Morning starts a brand new day, and I am woken by a small son and a bigger son, and we go downstairs. My coffee flows down, liquid warmth, and slowly my brain begins to function. This morning I find myself thinking random phrases, putting into unending run-on sentences a description of what goes on around me. I slice peaches and bananas to feed these hungry few, and I think about the hungry many that I read about on the Internet. The TV plays in the background as my hands get covered in slimy mess - peaches are hard to cut when they've been peeled - and I peek out the window to see two small birds hopping around on the grass outside under the birch tree. A gift? Interruptions are a constant part of the every day. Children are hungry, bored, tired, just need a cuddle. I pick up this small one, now finished his breakfast, and we walk to the toy room. He leans his head on my shoulder, and we look out the window to the backyard together. He loves to look outside, and the wonder on his face as he sees God's creation melts my hearts. "Paaa," he whispers, because that's his answer to everything. I leave him standing at the door as I try to come back and put the words onto paper that fill my head with a constant flowing stream. I stir the oatmeal. I notice that the clock on the stove reads exactly 7:00 as I wonder how it's possible to feel so extremely lonely while at the same time just wanting to run away from it all and become a hermit. Life is hard, and the encouragement from those around and those online helps, but there is still this day to day living and the plodding on one day, one step, one moment at a time. I reach for the forgotten oatmeal, not quite yet burned, but definitely done, and I find myself noticing how this allowing myself to think in sentences helps to find the grace in the small things. It slows my brain to think with words instead of feelings and reactions, and it becomes easier to live in the moment because life suddenly isn't an emergency, but this naming of it all...yes...that is what this is, and Ann speaks of it in the "One Thousand Gifts Devotional", page 57, how naming gives identity and meaning and solves mysteries. I wish I could say this is easy to keep doing. But the truth is that to keep my braining running on like this is also tiring, and I have limited stores of energy in my sleep deprived state. So for this morning, I enjoy these brief moments of higher functioning. Too soon, the children spill from the living room to the kitchen, words running cacophony, jumbled, drowning out whatever thoughts still percolate, and I'm back to reacting, providing for needs, one moment at a time. I know I missed my Monday update for counting gifts this week. You'll have to forgive me. We went camping from last week Friday through till Wednesday, and I deliberately left my laptop at home so I couldn't even blog if I wanted to. Our trip was as relaxing as camping with a one-year-old can be, but I was pretty ready to come home when we did. The waves on Lake Huron were ridiculous this year - only one day where it was actually calm, and the ensuing noise from the surf started to drive me batty and made sleeping difficult. It was interesting, though, how much easier it was to find gifts from God while surrounded by His creation. Along with this, life slows down significantly while you're camping, and it was that much easier to breathe deeply and take the time to really see what was going on around me, not to mention I love all the smells that go along with camping, so half the time I was breathing deeply just to enjoy the fantastic scents filling the air. Another lesson occurred to me that needs to come out of this journey of 1000 gifts - connecting those gifts with their source, and seeing God's love for me through the graces He gives, and being thankful to Him, not just being thankful to be thankful, but actually being thankful to the One who gives the gifts. There is so much to learn! Sometimes I feel like it will take a lifetime to learn everything I need to. And maybe another lesson there is that I don't need to learn it all at once, to go slow and pick one lesson at a time. So for now, I continue to focus on seeing the graces around me as gifts. Maybe once I get that down, I can work harder on being truly thankful to the One who gives them to me and recognizing His love through them. After a particularly rough night with Nathan (up at 1:30am...for some reason I thought it was 4:30 and I got prematurely excited until I came back to bed and saw the clock for real...and then he proceeded to be awake till after 3), my morning devotional speaks of trust. Trusting God as being the source of joy and something we must do to combat anxiety. Ann quotes Romans 8:32, "He who did not spare his own Son, but gave him up for us all -- how will he not also, along with him, graciously give us all things?" And she points out how God has already given us the greatest gift, his Son Jesus, and if He gives us this amazing and wondrous gift, how can there be anything He would withhold from us? "How will He not also graciously give us all things He deems best and right?" (One Thousand Gifts Devotional, p.34) He is worthy of our trust because He has already given us the greatest of all gifts. I'm struggling with this today. If He truly gives us all the things we need, why on earth am I not getting enough sleep?? I allowed myself a long tangent of mindless ramblings that ended up spiraling out of control into some pretty deep cynicism. So I stepped away from the laptop for a moment and walked out onto the back deck with Nathan. The fresh air reminds me to breathe deep and clear my head, and I come back and delete what I wrote because I didn't like it, and most of it didn't make much sense anyways. I found myself contemplating my search for graces a bit more yesterday. An interesting thought occurred to me that I think is a bit of a breakthrough in the whole thing. You remember how I talked yesterday about how I'm not good at recognizing God's gifts around me? Yeah, well, I've realized a bit just how terrible I am at recognizing those gifts. That phrase, "all is grace", if all is truly grace, then every single little tiny thing about this life is a gift from God. Every.Single.Thing. It shouldn't be so hard for me to find God's gifts because they literally are all around me, surrounding me constantly. The issue isn't that I have to wait for God's gifts to come for me to see them, as if He only gives them out one at a time like when you receive presents at Christmas or on your birthday. His gifts are continuous, they're already here, they're everywhere, and we don't have to wait for them. So the problem is with me. If I'm not recognizing God's gifts, I need to change my perspective. If I'm not seeing grace, it's not because grace isn't there. Grace is always there because all is grace, and I need to choose to see it. That's the key. Seeing the gifts is a choice. I can choose to recognize something as a gift, or I can choose to see it as an inconvenience, or an annoyance, or I can just ignore it completely. It's my heart that needs to change, and I need to choose to be thankful. And in choosing thanks, I also choose joy. Don't get me wrong. This is no simple thing. I get that. Just because something is a choice doesn't mean it is an easy choice. Maybe it should be. Sometimes I wish it would be. But life brings challenges. The day to day wears us down, and we are tired, and we struggle with depression, and I have been there, and I am there, and choosing joy and choosing to be thankful is hard. But maybe my realizing that seeing the gifts is a choice will make it easier for me to see them. Because the gifts are here, the grace is here. I must choose to see it that way. It's been one week of counting graces. I didn't quite get three a day, but each day did at least have one. As I said to Dad in an email earlier this week, I've discovered two challenges. One, I'm not very good at recognizing the gifts of God in the little day to day things around me yet. Granted, we've just started on this journey of 1,000 gifts; clearly, I have a long way to go, and isn't the point of it to get better at it as we go? The second challenge is that I'm not good at remembering to even keep my eyes open to look for graces to begin with. I've gotten so used to just plodding through the day, getting from one task to the next, struggling just to find the energy to keep going, that I often forget to engage in the world around me and notice the good things with which God has gifted me. Can I blame sleep deprivation for a bit of that? Nathan's had some up and down nights lately. It is a continuing struggle not to get angry at God about it - childish and silly of me probably, but when it's 4am, and you just want the baby to go back to sleep without needing me to stand there till morning, and my brain stops thinking rationally and my soul just cries out to God, "How long? Will you forget me forever?" So, obviously, I need to practice this practice of being thankful for big and small gifts, of praising God throughout the day, and maybe even in those dark hours of the night. And really, calling it a "practice" is so right - something we need to do over and over to work at getting better at it. It's my goal to get better at it enough that I will start to see the gifts around me as they happen and be thankful to God for His grace in the moment, instead of needing to look back at the end of the day to count His blessings. Which is not a bad way to do it and is kind of how things are at this point, and certainly, I probably won't end up writing them down until I finally get a chance to sit down and have some peace. But I want to be better at being thankful here and now, when life gets messy and loud, and to learn things like being thankful for two, healthy rambunctious boys instead of being aggravated at the noise and interruptions. Here's a sampling of some of the gifts I found this week. How about you? If you've decided to join us in the counting of 1,000 gifts, let us know how your week went by commenting below. After almost three years of living in our house, I have determined that the people who lived here before us were, for lack of a better word, idiots. Okay, that's not kind and maybe a bit harsh. They probably weren't actually idiots. But they sure were challenged when it came to "do it yourself" fix-it projects around the house. They might not have been idiots, but they should definitely have learned somewhere along the line that maybe it would have been a better idea for them to call someone to help them with various renovations that they tried to do before they put this house up for sale. Case in point: you see that hole in the middle of the floor? That's a furnace vent. In the middle of the floor. First of all, I'm pretty sure that at some point, they decided to widen the doorway between the kitchen and dining room to give a more open concept feel. Which I'm not really opposed to, and in general, it does work for our house, and I'm glad of the extra space. However, it means we have a furnace vent in the middle of the space between the dining room and kitchen. The second problem: see how the vent and the vent cover thingy are lying on the floor next to the hole? 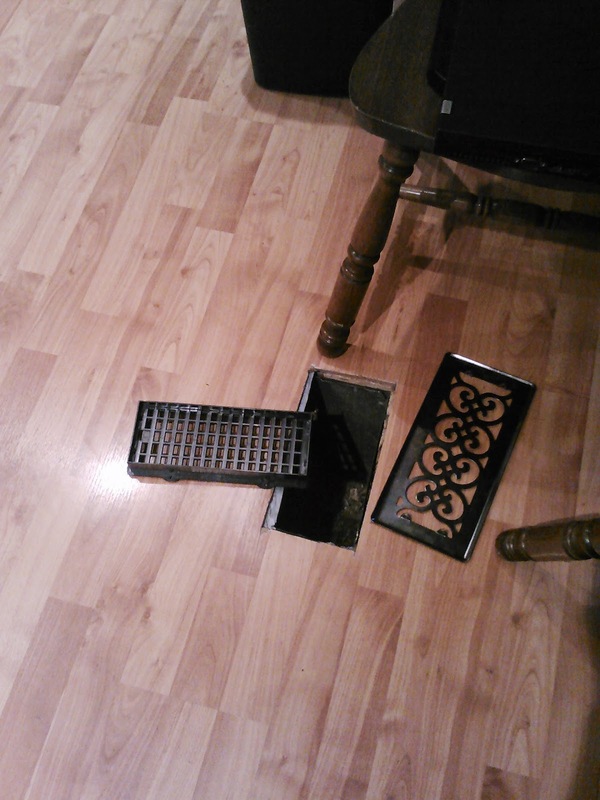 Yeah, well, somewhere in the process of either making the hole or redoing the floor around the hole, the hole became too small/too big/completely the wrong size to properly fit a vent cover on it. That black piece is supposed to screw into a little lip that should be around the hole. Except there is no lip. So the black thingy just sits loose in the hole, and the vent sits loose on the black thingy, and Nathan likes to pull it off and play with it. And then yesterday, Reuben walked through the kitchen, stepped on the black thingy, and wound up with his leg down the hole. Twice.